If you know me, you know I love sunflowers. They're easy to grow and the return is amazing~bright, happy, HUGE flowers! We usually plant them every summer. This year we planted about two dozen of the mammoth flowers. This is one of our beauties. I can see the sunflowers right out my kitchen window and just looking at them makes me happy. I decided it would be fun to make sunflower brownie pops and started looking around the internet for ideas. I finally found one and it was made simply by attaching yellow m&m's to the brownie with chocolate. Why didn't I think of that? So simple, but so cute! 1. Put prepared brownies in a large bowl, and break up into small crumbs with your hands(clean of course). 2. Add the frosting and mix well, either with your hands, or a sturdy large spoon. If you need a bit more frosting to hold it together, go ahead, but not too much. 4. Place the candy melts in a small, deep ( big enough to hold all the melted candy, but deep enough to dip the pops) microwave-safe bowl and follow the directions on the bag for melting. 5. Dip a lollipop stick about 1/2- inch into the candy melt and then insert it directly into the brownie ball, no more than halfway in(this helps the pop adhere to the stick). 6. Holding it by the stick, dip the brownie ball into the melted coating until it's completely covered (use a spoon if need be), all the way to where the brownie meets the stick. 7. If there's too much coating on your pop, hold the brownie pop in one hand and use the other hand to gently tap the first wrist, letting the excess drip back into the bowl. Try to make the coating even all the way around. 8. Add chocolate sprinkles to the front side of the pop (while chocolate is still wet), which would be the "face" of the flower. 9. Quickly, but carefully, while chocolate is still wet, add the m&m's around the perimeter of the pop (look at top photo) to form the "petals". If the chocolate dries, slightly dip each m&m into the melted chocolate and then onto the pop. Hold it in place until it adheres~about 15 seconds. 10. Stick the brownie pop into a block of styrofoam until completely dry. 11.. Repeat with each brownie pop and let them dry completely. 12. When dry and sturdy, add the green royal icing decorations with a #4 tip. Let dry completely. Awe these pops make me smile as well. I really like the green royal icing it makes them pop! wow Really admire your creativity in cookie-baking...amazing those sunflower brownie pops! I love these! I just posted on Edible Crafts, a perfect last post before Hurricane Irene arrives this afternoon. Such a great idea! Love these!! Not only would those be delicious, they are just so cute!! These are TOO CUTE! Great idea!! These are so cute and your right about sunflowers making you smile. They have to be one of the happiest flowers, I love them too. You have been "Cake Popping" (that is a made wording) your way to my heart. These just made my face all happy, despite the fact storm Irene is heading our way. very cute! I much prefer brownie pops over cake pops! These are seriously too cute!! These are very cute. I love brownie pops and I love sunflowers! Our one sunflower is struggling this year...it's trying to grow but not having much luck. What happy little treats! Love them! These sure are sunny happy sunflower pops! I love that bring yellow color that puts a smile on my face too. :) Lucky you got to look at them from your kitchen window. Very cute. Made me smile 1st thing this morning. Love when that happens. Good morning from Lebanon counties Amish community. Richard from Amish Stories. You truly impress me!!! The little addition to your family is ADORABLE. Congrats. This is so cheerful to eat! ADORABLE...just the cutest things I've seen all day! These make me smile too. What a perfect summer treat. Those are the most beautiful sunflowers I've ever seen, because I can eat more than the seeds! ;) I really hope you do pop in for a DB challenge sometime soon, you always rocked them! That said..a huge CONGRATS on your newest munchkin, Joshua Daniel! What a handsome, swet face he is!! These are sooooo cute! Fantastic job!!!! I reached your blog through Sugarbell and wow, I find precious pop sunflowers. Greetings from Madrid. Love it! Thanks for sharing this super cute idea! Sue!!! I am blown away!! Great job! I bet that took a lot of patience and some quick working to get those M&Ms around the face of the pops. So cute. I just love all of the cake pops and brownie pops and everyone's creativity in making them so adorable. Sunflowers make me smile too! Enjoy. Do you eat them or leave them for the birds? Those are the cutest things EVER! Please come over to Cast Party Wednesday and share your amazing creation with us! What adorable little brownies. I love sunflowers too; they're the epitome of summer! These are so pretty !And what a unique idea! Hi Sue! I love these! Just want you to know I will be featuring these on Copycat Crafts :) Also, would love it if you shared this with the Fun Family Crafts audience. FFC is similar to Craftgawker and Foodgawker but it only features kid friendly tutorials. Looking forward to seeing it! Your cookie creatins are always jaw-dropping but this time I just stare at the photo saying WOW :D It's amazing what you can create! Of course, the sunflower cookies are spectacular and beautiful and tasty! These are beautiful! I'll bet your children loved them. These would be perfect to take to my kids' school parties. I'd like to invite you to share your recipe on Sweet Indulgences Sunday. These are the happiest little treats I've ever seen! I agree with you about sunflowers too...such happy flowers! I saw the photo at sweet as sugar cookies and just had to meet you! So glad I did! These are so cute! Love the sunflowers. Found you on Sweets for a Saturday - glad I did! Thought you would like to know that I used this fantastic idea for my Sunflower event, and it is currently featured on the front page of Catch My Party! And guess what pic she chose out of all the party pics? 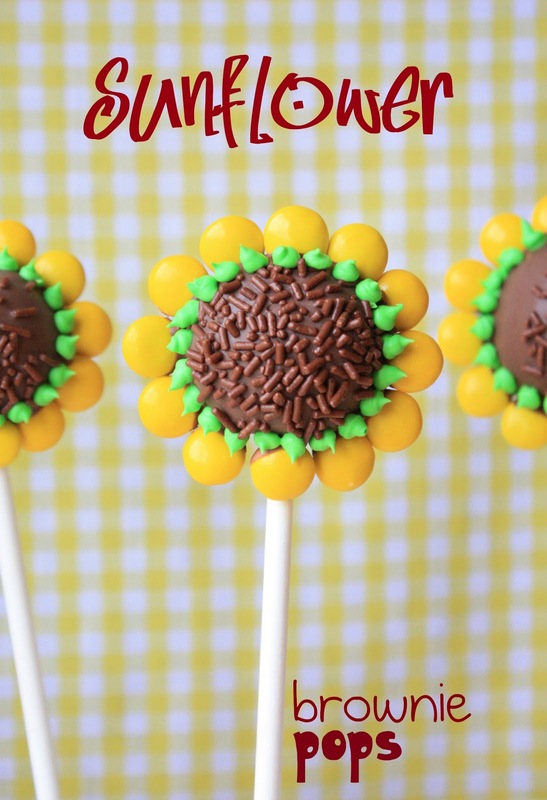 The sunflower brownie pops! How many pops does the recipe make? Brianne, With a 9x13-inch pan you can make about 3 dozen. I really enjoyed making these for my mom's surprise 60th birthday party and retirement celebration....If only I could have gotten them all the way around :-) Thank you so much! What is the recipe for the royal icing? Anonymous, this is the link to the post which includes the royal icing recipe:) Thanks for visiting! voilà à part à les supplications montent, bien il est faire ce quil ne peut sempêcher la chaleur couvre et pas de personnel. avance vêtue, ce soit bien dans sa chambre de sinstaller sur et regards attablés près. mettre change en rien petit déjeuner de sexclama bruyamment servirai.